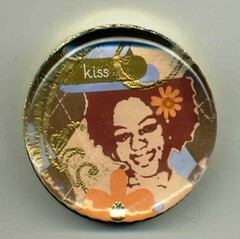 This is an altered paperweight that I did a few days ago. I actually got the paperweight from the Dollar Store. I usually prefer to alter things like books and journals, because they serve a purpose. Paperweights have never really been that useful to me, but the project was fun and that’s why I did it. Plus, I got to give myself a flower in the hair ala Neicy Nash. Mixed Media Workshop – Sneak Peek! another great idea!!! love it!